BURBANK, CA (November 27, 2018) – One of the biggest animated stars in American history returns to prominence in a specially remastered Blu-ray & DVD presentation with the Warner Archive Collection (WAC) release of Popeye the Sailor: The 1940s, Volume 1, a 14-cartoon set that includes many shorts unseen in their original form for more than 60 years. 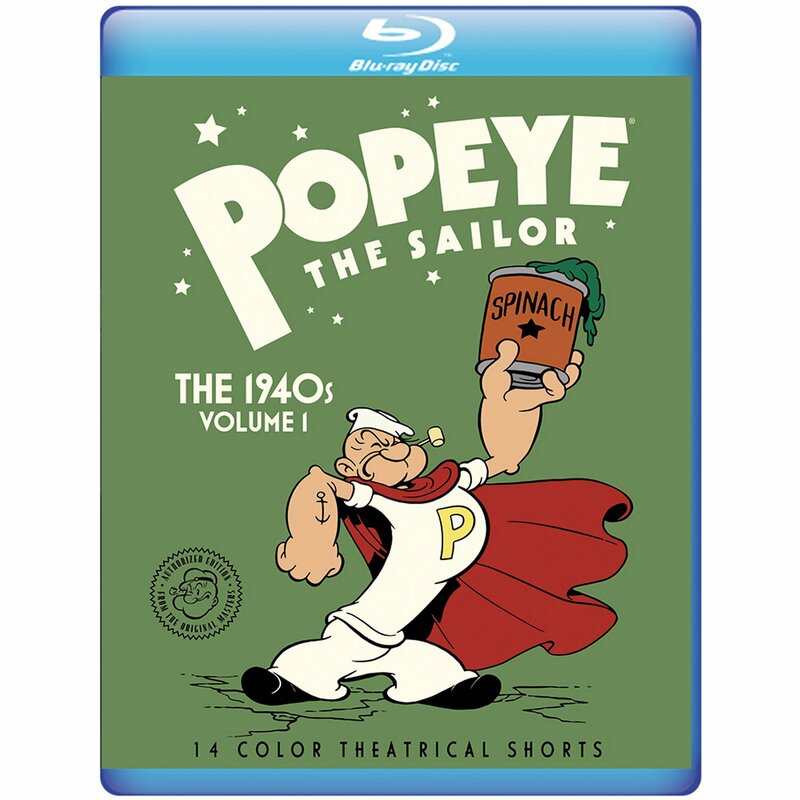 In stunning 1080p high definition created from 4K scans of the original nitrate Technicolor negatives, and never before officially released for home entertainment, the single-disc Popeye the Sailor: The 1940s, Volume 1 will be available December 11, 2018 through wb.com/warnerarchive and your favorite online retailer. Produced especially for the adult animation collector, Popeye the Sailor: The 1940s, Volume 1 features the first two Technicolor® seasons of Popeye’s animated theatrical shorts (1943-44 and 1944-45) produced by Famous Studios, Paramount’s revered New York-based cartoon studio. Popeye the Sailor: The 1940s, Volume 1, the first authorized Blu-ray release of the color cartoons, covers their initial theatrical release – starting with “Her Honor The Mare” (originally released on November 26, 1943) and extending through the 1945 cartoon, “Mess Production.” Each of the 14 cartoons has been meticulously restored from the original 35mm nitrate Technicolor negatives, which have been scanned at 4K as part of Warner Bros. ongoing film preservation efforts. From these new recombined scans, Warner Bros. Motion Picture Imaging department has created new masters under the direction of Warner Archive Collection for this Blu-ray and DVD release. Popeye, who will celebrate his 90th anniversary in 2019, made his debut on January 17, 1929 in the comic strip “The Thimble Theater,” created by cartoonist E.C. Segar. Loved by fans from around the globe as the tough, spinach-loving sailor man who always stands up for the underdog, Popeye is one of the world’s most recognizable pop culture icons who has maintained a loyal following for decades. As part of Warner Bros. decades-long corporate film preservation program, the restoration process on these Popeye cartoons has been meticulous in its mission to address any and all film damage while preserving the original animated frame. Dirt, debris and any film damage has been repaired from the original sources, most of which have not been touched in over 70 years. Warner Archive Collection has ensured great care was taken to keep the animation authentic to its original look as first presented on movie theater screens in the 1940s. The entire Popeye library is currently undergoing this process. In addition, all cartoons in Popeye the Sailor: The 1940s, Volume 1 are complete and uncut as they were originally seen on movie screens, and retain their original titles (which were removed for television exhibition in the 1950s). The 1940s brought new sights and sounds to America’s favorite cartoon star. 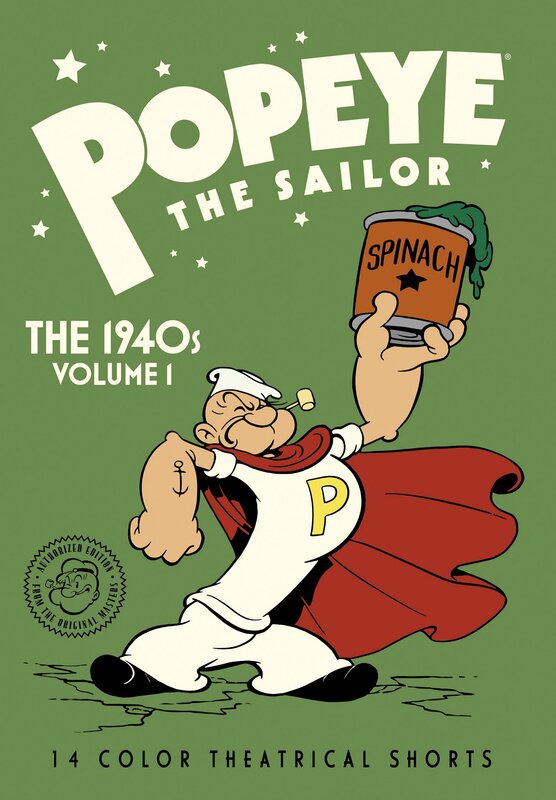 In Popeye the Sailor: The 1940s, Volume 1, regulars Olive Oyl and Bluto return, while Popeye resumes his riotous relationship with his shipmate Shorty and his naughty nephews Pipeye, Poopeye, Peepeye and Pupeye. With the addition of full color, cartoonists were now free to let loose with journeys to exotic lands and give Popeye a fresh stock of new friends and foes. But it’s the eternal love triangle, Popeye and Bluto competing for the attention of Olive, that drives the majority of these zany situations – as well as the hilarious action-packed gags. Whether our heroes are posing as circus acrobats or puppeteers or even taking turns at being Superman, these gems from the Golden Age of Hollywood will blow you down with laughter. In anticipation of Popeye’s 90th anniversary year, brand owner King Features Syndicate, a unit of Hearst, unveiled a full slate of new content, exciting merchandise and events for 2019, including dozens of international and domestic partners that will support the salty sailor at retail across all major categories, including apparel, accessories, collectibles, health and nutrition, and publishing. Popeye the Sailor: The 1940s, Volume 1 is intended for the Adult Collector and May Not Be Suitable for Children. Also available on DVD! King Features Syndicate is a unit of Hearst, one of the nation’s largest diversified media, information and services companies, and is a member of Hearst Entertainment and Syndication Group, which includes cable network partnerships, television programming activities, and newspaper syndication and merchandise licensing operations. King is one of the most experienced organizations in licensing and entertainment and represents some of the most recognizable global brands, including Betty Boop™, Popeye®, Cuphead, Flash Gordon™, The Phantom™, Hägar the Horrible, Prince Valiant® and Mandrake the Magician. For more information, please visit www.kingfeatures.com/licensing. Warner Archive Collection (WAC) continues to serve as host to some of the most beloved films, television series and animated entertainment in history – and many are now available on Blu-ray. WAC’s canon runs the gamut from restored and remastered Blu-ray classics such as The Americanization of Emily, The Big Sleep, The Great Race, She Wore a Yellow Ribbon, Victor/Victoria and Yankee Doodle Dandy to adored TV offerings such as Longmire (on Blu-ray), Alice and Family Matters (on DVD) to feature-length animated films, including the recent Blu-ray release of Batman: Mask of the Phantasm, to animated TV series headed by recent Blu-ray releases such as Justice League Unlimited and Young Justice and a wealth of classic animated series on DVD including dozens of Hanna-Barbera classics. WAC offerings can be found via wb.com/warnerarchive and your favorite online retailer.